The Day After the Verdict: Is This a Joke? By LizLike many others, I have been asking this question for months. First, back in August, when news outlets reported that Bob McCulloch, the prosecutor for St. Louis County, had a long history of siding with the police; that his father, a St. Louis cop, was killed on the job by a black man; that his brother, uncle, and cousin were cops as well; that his mother had worked as a clerk in police headquarters; that he himself had wanted to be a cop until one of his legs was amputated in high school. His office would be responsible for presenting the case of Darren Wilson, a Ferguson cop who shot and killed Michael Brown, before a grand jury. By Paul Rosenberg[A]uthor, attorney and NBC analyst Lisa Bloom did the best job of zeroing in on precisely how the grand jury process had failed in a number of appearances on MSNBC the day after McCulloch’s announcement. In a virtual replay of the Trayvon Martin case, subject of her book Suspicion Nation, the prosecutors simply dropped the ball and did not do their jobs. Before she read the transcripts, Bloom noted, “I suspected that he wasn’t cross-examined, instead he was just allowed to talk in a narrative and tell a story and in fact, that’s exactly what happened,” which is a lawyer’s way of saying what the woman in Starbucks told Zach Roth—the prosecutors were treating Wilson like he was their witness, helping them make their case against the accused—Michael Brown. They were not treating him like a suspect or defendant, or even a witness for the other side. They were treating him like one of their own—which, of course, is exactly what he was. And that’s the basic problem, in a nutshell. That was hardly the only example Bloom cited on air that day. “There are so many parts of that transcript that jumped out at me as a trial lawyer that I would want to cross examine him about if I were the prosecutor,” Bloom said. By Judd LegumJustice Antonin Scalia, in the 1992 Supreme Court case of United States v. Williams, explained what the role of a grand jury has been for hundreds of years.It is the grand jury’s function not ‘to enquire … upon what foundation [the charge may be] denied,’ or otherwise to try the suspect’s defenses, but only to examine ‘upon what foundation [the charge] is made’ by the prosecutor. Respublica v. Shaffer, 1 Dall. 236 (O. T. Phila. 1788); see also F. Wharton, Criminal Pleading and Practice § 360, pp. 248-249 (8th ed. 1880). As a consequence, neither in this country nor in England has the suspect under investigation by the grand jury ever been thought to have a right to testify or to have exculpatory evidence presented.This passage was first highlighted by attorney Ian Samuel, a former clerk to Justice Scalia. 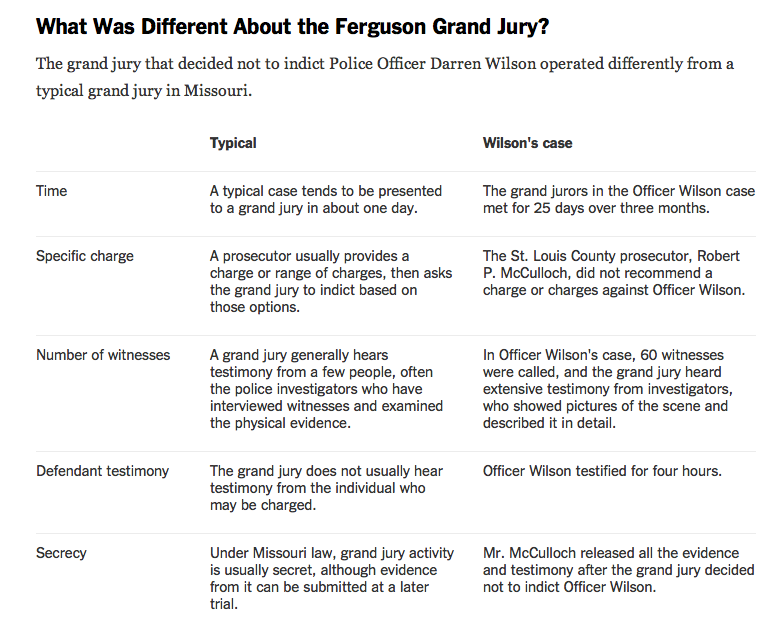 Comment: For more on Ferguson, see Wilson's Testimony in Ferguson Shooting and Killing Blacks = "Perfect Crime."